The 21st century is experiencing many huge global transformations. More than half the world's population now live in cities; at the same time, climate change is causing more and more natural disasters, and those disasters are increasingly affecting urban areas. The world's population is also getting younger, with a huge growth in the youth population. One of the regions most affected by these transformations is the Middle East and North Africa. According to the United Nations Development Programme, Arab countries cover 10 percent of the world's area but receive only 2.1 percent of its average annual precipitation. Per capita renewable water resources has fallen to 743 cubic meters, well below the poverty level of 1,000. Droughts are expected to turn more extreme, and water scarcity is expected to exacerbate both political and economic tensions. At the same time that environmental problems are creating significant strains on the economy, there are pre-existing economic challenges in the region. Unemployment in the Middle East is the highest in the world and primarily affects youth. With a youth unemployment rate at about 25 percent, higher than any other region in the world, the Middle East's economies aren't just threatened, their political stability is as well. Recently I attended the Eco-Cities of the Mediterranean Forum and Expo in Jordan. Along the shores of the Dead Sea, representatives from governments, businesses, international organizations and NGOs across the region met to discuss how to address these pressing issues. They all agreed that the current trajectory is unsustainable for both the environment and the economy. But the more I spoke with them, the more apparent it became that these numerous challenges also represent a great opportunity to build a newer, greener economy. As the green business sector continues to grow, opportunities for businesses and individuals will grow with it. It is up to all of us who work in the region to find innovative ways to forge these partnerships and help create sustainable economic growth. That's the approach my organization, Global Communities, is taking. 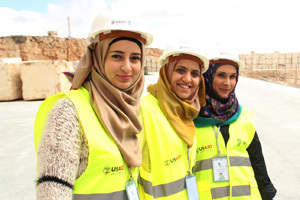 As an international development organization that has worked in the Middle East for 20 years, we know firsthand just how important a green economy is to the future of the communities of that region. Our focus is on helping communities adapt to the threat of climate change, by ensuring our work is laying the foundation for an improved economy that is receptive to greener initiatives. 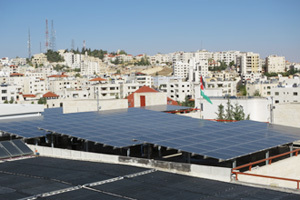 The Jordan Loan Guarantee Facility is helping small and medium enterprises with access to bank financing for start-up and expansion, including investments in solar energy solutions. Jordan Loan Guarantee Facility, an impact finance program that has provided technical assistance and issued over 140 loan guarantees to enable Jordanian small and medium enterprises (SMEs) to access over $35 million in bank financing for start-up and expansion. Among these transactions are investments in solar energy solutions which serve as examples for the SME sector -- the main driver of private sector development and the most significant pool of clean technology solution providers and users. Through its technical assistance program, JLGF is strengthening bank lending practices and developing credit products to support clean technology solutions -- a necessary step to a greener future. 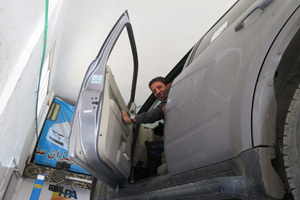 MENA-YES is training youth in key sectors, such as hybrid mechanics, to prepare them for the workforce. Our Middle East North Africa - Youth Empowerment Strategy, in partnership with the Caterpillar Foundation, links companies, training providers, and vulnerable youth in Jordan, Lebanon and Yemen to develop a workforce with the skills and knowledge needed in key sectors -- including those in demand by a green economy such as hybrid mechanics. The aim is not only to help reduce youth unemployment, but to support the broader economy as well. In the West Bank, our vocational engineer training program for recent graduates includes a special component for green engineering fellows. And in the West Bank, with the support of USAID, we have facilitated a partnership between the Engineers Association, local universities and Khatib & Alami, a global architecture and engineering firm, to support an Engineering Fellows Program for recent college graduates, which includes specific green engineering fellows. If we are going to move towards a greener future, we will need professionals like these fellows -- trained in science, engineering, technology, and mathematics -- to create and innovate new processes and products. Environmentally sound practices need not stand in the way of economic growth and diversification. We need to facilitate public-private partnerships and promote green building principles while retaining flexibility to create space for small businesses to succeed. Governments can lead the way by setting green standards for public facilities like schools and clinics. Elected representatives need to provide incentives or businesses won't invest in areas where that investment will transform the economy. It was heartening to see how cities, businesses, and organizations across the Middle East are now leading the charge on economic development and environmental protection. Even more encouraging is that these lessons don't just apply to the Middle East; they apply to all regions interested in creating a safer and more livable planet for everyone.